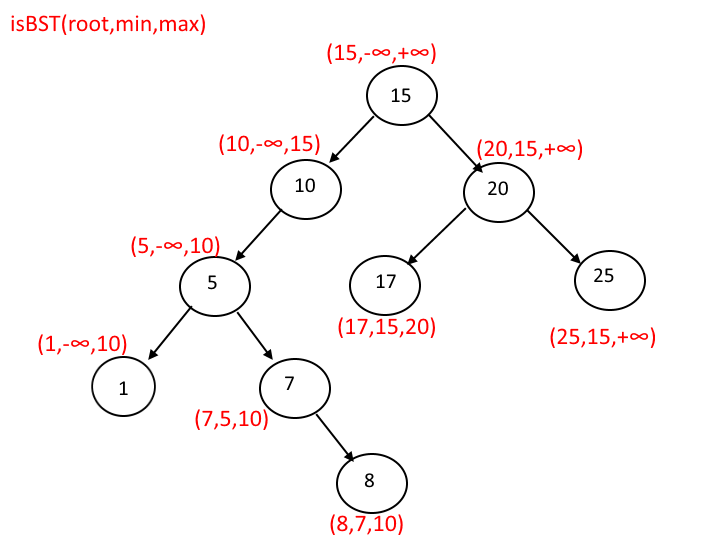 Objective: Given a Binary tree, find out whether its binary search tree or not. Output: True or false based on whether tree is BST ot not. 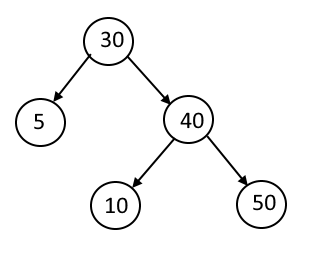 Do the inorder traversal of the given binary tree. check if the previously visited node is less than the current node value. 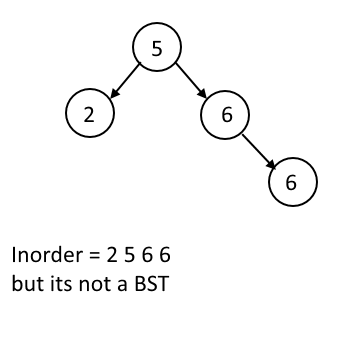 Now in the above example you can see that when you validate the Node 40, 10<=40<50 so it will return true nad when you validate the Node 30, 5<=30<40, will return true but as you can see that this tree is not BST since 10 is smaller than 30 so it should be on the left of the 30. Actually all the nodes less than 30 should be on the left and all the nodes greater than 30 should be on the right. How would you achieve that??? Your root value can have any value between -∞ to + ∞. When you validate the right child of 30, it can take any value between 30 and + ∞. When you validate the left child of 30, it can take any value between – ∞ and 30. likewsie when you validate the left child of 40, it can take any value between 30 and 40. So the idea is Pass the minimum and maximum values between which the node’s value must lie. we start with the range minimum = Integer.MIN_VALUE and maximum = Interger.MAX_VALUE, so when checking the left node of 30(root), minimum will be = Integer.MIN_VALUE and maximum = 30, so on. See the figure for better understanding. 239 queries in 0.119 seconds.